2010 Infiniti EX: All models receive standard heated outside mirrors, USB audio jack and automatic headlights. Journey models receive Bluetooth phone connectivity and are offered with Advanced Climate Control while AWD models are fitted with standard heated seats. The optional Bose audio system, and the optional navigation system, are both upgraded. 2010 Infiniti FX: Minor updates include standard Bluetooth phone connectivity and USB audio jack, while the Bose premium audio system and optional navigation system are upgraded with additional features. 2010 Infiniti G Convertible: The navigation system now delivers XM NavTraffic, NavWeather, and Zagat guides and there is a new white color scheme offered within the cabin. 2010 Infiniti G Coupe: The coupe receives new technology and audio upgrades, a new wheel finish, and more standard equipment. 2010 Infiniti G Sedan: A minor exterior refresh and new technology and audio upgrades headline the changes. Many of the option packages have been updated with even more equipment. 2010 Infiniti M: Scheduled for replacement in March of 2010, it is mostly a carryover. 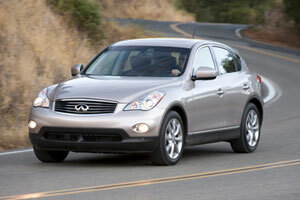 2010 Infiniti QX: With an all-new model expected for 2011, the 8-passenger SUV is a carryover for 2010. There are a handful of changes to Infiniti's smallest crossover for 2010. All models receive standard heated outside mirrors, automatic headlights and, on AWD variants, heated front seats. A USB port is also standard. The Bose audio package now includes a 2.0GB Music Box hard drive and Around View monitoring. Journey models get standard Bluetooth and an optional Advanced Climate Control System (ACCS) optional. Navigation is upgraded with streaming Bluetooth audio, XM NavWeather, and a Zagat restaurant guide. After a complete redesign for 2009, the FX receives only minor updates. Bluetooth hands-free phone connectivity is now standard on all models, and a USB connection port (and iPod interface) is now standard as well. A 2GB Music Box hard drive has been added to the Bose premium audio system on models without the optional navigation system, and the nav system now features Bluetooth streaming audio, XM NavWeather, and an integrated Zagat restaurant guide. The G Coupe's drop-top variant, with a power-operated, 3-piece folding hardtop roof, was introduced in 2009. It receives minor updates for 2010 that include a new exterior color scheme, updated center console design on automatic transmission models, and the next-generation navigation system upgrade. The sportiest car in the brand's lineup, the G Coupe receives several technology and audio updates to keep the design fresh. There is also a new center console design on automatic transmission models, new wheel finish, and a new interior trim. Standard rain-sensing wipers and a power-operated passenger seat are among the equipment changes for 2010. Blending luxury, sport and technology, the Infiniti G Sedan competes in a competitive segment with the BMW 3 Series and Mercedes-Benz C-Class. The 2010 model year brings a slight exterior refresh unique to the sedan and two new colors. Like its coupe sibling, the G Sedan receives a new center console design on automatic transmission models and a new interior trim. There are new standard features, and the option packages have been reconfigured. The Infiniti M is in the final year of its product cycle as an all-new, 2011 M model goes on sale in early 2010. The big changes for the M happened in 2009, when the luxury sedan received an upgraded 3.5-liter V-6 and the company's latest 7-speed automatic transmission. In advance of a significant refresh planned for the 2011 model year, the 2010 Infiniti QX is unchanged from last year.